Riders of a brand new rollercoaster at Six Flags Discovery Kingdom in Vallejo, California, went on the ride of their life yesterday, though not perhaps the kind they were expecting. 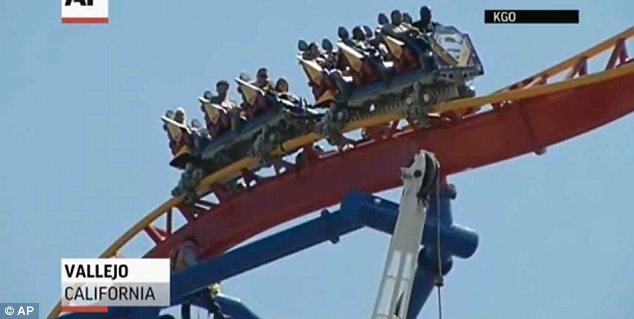 The two dozen men and women found themselves stranded 150 feet above ground for nearly two hours when both the cars of The Superman Ultimate Flight ride stalled atop the track. Firefighters who arrived on the scene at 3:00 p.m. – around half an hour after the roller coaster stopped – were able to deliver water bottles to the riders in a large personnel bucket while mechanics worked to fix the problem. None of the twelve people were injured and all were lowered back to safety once the ride was re-started. It is unclear what prompted the malfunction that thankfully left the passengers upright at the top of the roller coaster. After their own efforts to get the car moving again by rocking back and forth, failed, firefighters waited for instruction. Vallejo Fire Battalion Chief Ray Jackson told Associated Press that they were trained for such a rescue operation in case this type of situation should ever arise. The new ride opened June 30 at the Vallejo theme park, holds two cars with six riders each and can travel at up to 62 mph. It ride will be closed for a “thorough safety inspection,” Six Flags spokesman Nancy Chan said, adding that the ride will reopen when the inspection is completed. “If (a ride) stops, it usually detects something and it stops for safety reasons,” she explained. Though Nancy Chan revealed that the theme park staff has collected the names and contact details of the passengers, the issue of compensation remains murky. “I don’t know what compensation, if any, would be given,” Nancy Chan told the Vallejo-Times Herald. Nancy Chan also claimed not to know of such an incident having occurred before despite one park visitor’s claims that her eight-year-old son was stuck for eight to ten minutes when his ride stalled two weeks ago. Tiffany Sanchez told the local paper no compensation was given.